Turtle the cat is missing. Please click the image to see the flyer. Turtle the sweet-natured calico cat, last seen on Thanksgiving, disappeared near Hanford and Beacon. Have you seen her? Her dog (yes, her dog) is getting worried. 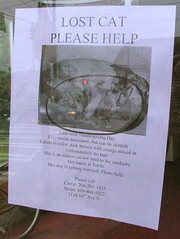 Click the image to the right to see a larger photo and contact information for her humans.